Somewhere off the Portuguese coast, rain pours down hard. Lightening flashes in the background. He lifts his bloodied face and smiles. He is surounded by four bad guys, held back and beaten. Even when the historical gold cross is taken from his bag, he still believes. He knows that object should be in a museum, and has no quarms is saying it, despite his predicament. Those words, “that belongs in a museum”, spoken with passion by Indiana Jones, are inscribed above every museum curators door. Well, they should be. Too often do we see things sold to private collectors, and I have even seen specimens on eBay. More often than not there is nothing we can do but watch as unique objects go off to the highest bidder. Sometimes there may be something we are able to do. Or at least try. Recently I saw a large collection go to a University. Not a University Museum – they live by the same rules as other museums. University Museums have curators, catalogues of collections, databases, and do some real cool things with their specimens. This collection went to a University teaching collection. This is a shame, because those specimens, with their own little stories will be used just for teaching – and this is a pretty limited audience. Only the students and a handful of lecturers will see the collections. Some universities do an open day once a year, and bring out some of their teaching collections (I have helped out with some over the years and they often bring out the same specimens, so the rest are kept in behind closed doors). Anyone wanting to carry out any research on the collections needs to know the collections are there – and these will be the university lecturers and a few select students. Even if there is research carried out on them, perhaps a dozen people may read the scientific paper. I have nothing against University teaching collections – in fact they are excellent at giving the students a chance to see real specimens instead of images on a presentation. I emailed around to museums to see if there were any experiences with University teaching collections they wouldn’t mind sharing. I heard back from a dozen colleagues with a mixture of good and bad experiences. One University transferred their dinosaur footprint collection to a museum, which was fully documented and included lots of additional data and has subsequently been researched on. A museum took on a University’s entire herbarium collection (over 10,000 specimens) and rescued a Diptera collection which was being badly attacked by pests: both collections had good data. One University Museum holds the teaching collections from three Universities with about 80% information associated with the specimens (one of the collections was from a University with a University Museum!?!). There are also some not-so-great examples. Some teaching collections were taken by another museum which had very little data associated with them, and were in very poor condition – any old documentation was chaotic and curators are still attempting to identify specimens over 30 years later. Another teaching collection has some fantastic skeletal and taxidermy specimens from all over the world, but no data with them at all, and are very badly eaten. Some years ago a museum took an entire geology teaching collection which had very little data with the specimens at all: the museum spent a long time with volunteers and members of the Russell Society on identifying them, eventually keeping just a fraction of the collection. 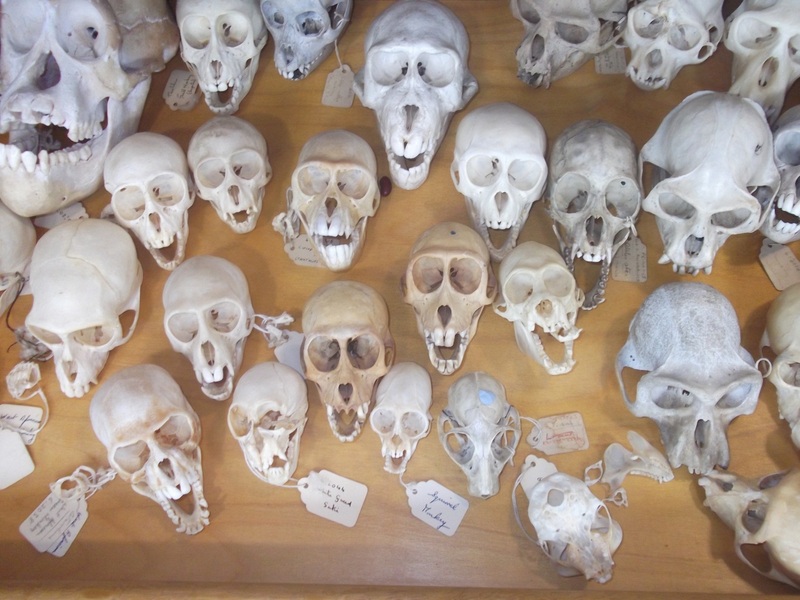 An amazing collection of primate skulls, including several of the same species. Lots of potential use with these specimens. But, they have no information with them, and no one knows they are there. An enormous herbaria collection was almost disposed of but quickly taken in by a museum. 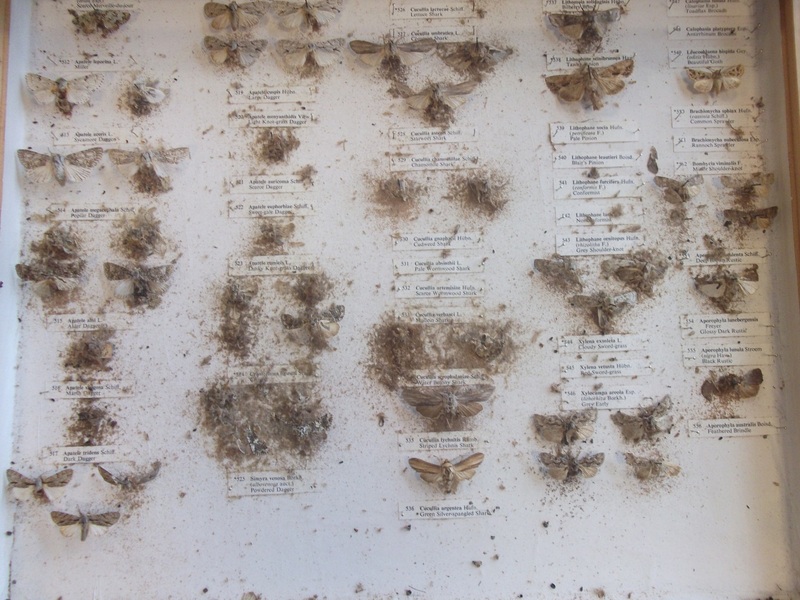 It held teaching specimens, PhD research specimens as well as individuals own collections. This took years of volunteers who knew botany to go through and assess the material. Lots had little or no information with them, but the collection did hold some really rare and unique specimens. Just to think that they were almost thrown in the bin. Some very ugly examples were also brought to life by colleagues. A University disposed of their geological collections with very poor data, and are now with a private individual. In the 1980s another University closed its Geology department, and skipped their teaching collections and students were told that they could take specimens from the skip. A few years ago a University skipped their entire teaching collections only for museum curators to hear about it after it was too late. The loss of unique and potentially important specimens must have been huge. Just one drawer of several from a University teaching collection. The moths have been eaten and completely destroyed. – information with the specimens is lost, or not kept. – the specimens are not cared for and get eaten/damaged/lost. These are just a few examples. Not all University teaching collections are poorly looked after. There are however enough examples to warrant a little concern. Of course specimens should be offered/donated to a museum first. Collections with information with them should be held in a relevant public institution so they can be accessed by anyone. The collections get cared for, and one hundred times the use! Donating to a relevant museum strengthens their collections by filling gaps, adding unique stories, and encouraging more researchers, artists, school groups, and public through new displays. This also makes it easier to identify where to go if you were looking for specific things from a certain area. Someone wanting to look at bat specimens from Devon would not go to a museum in Newcastle. The group that is often said to be the biggest users of teh collections are researchers. While it is true all museums have researchers using the unique, histoical collections, there is more. So much more that we should be shouting about! Collections are used for much more than research. There are probably many more examples of uses, but I will just share some of my own: I have artists each year coming in and taking inspiration from the collections; I bring specimens out and give talks about the local collections to local community groups; I have been out with local specimens to talk to elderly people suffering from dementia; I set up practical sessions using collections for undergraduate students to get up close and see real specimens. I bring bugs, fossils and skeletons out to schools inspiring hundreds of children every year; I have brought out the collections and their stories to people in shopping centres, the local hospital, the university and other places around the city. Museum collections not only are for active research, they have an even greater role in society: they are actively inspiring. 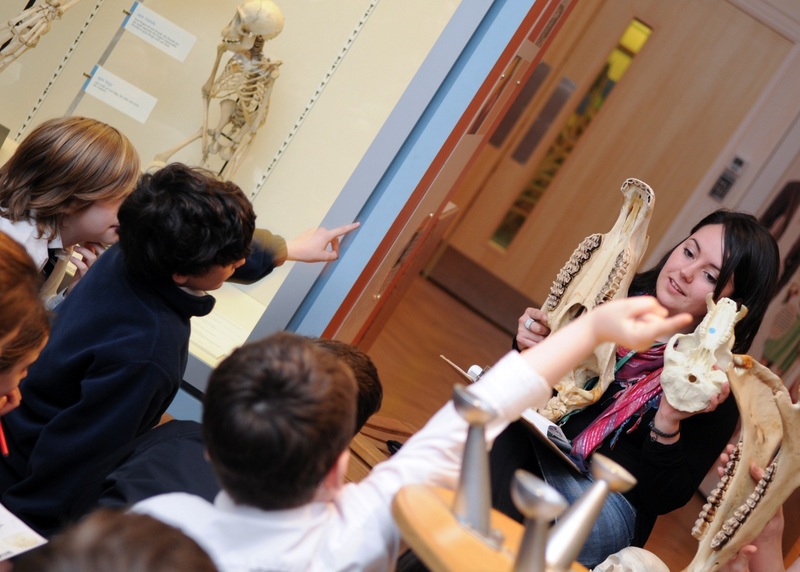 My fantastic old apprentice, Hayleigh, leading an interactive session about skulls and bones with enthusiastic children. Unfortunatley, the worst things about University teaching collections is the lack of any information with specimens, and the poor condition they are kept in. I have worked closely with three Universities, and I know that teaching colelctions are built up by individuals who are particularly interested in that area. They generally don’t record where specimens were from or when they were colelcted, because for teaching taxonomy this information isn’t needed. When the lecturer retires, or departments closed, then Unviersities get rid of these teaching collections. And if we are fortunate enough, a museum may get wind and rescue the collection from the skip. The difference with a museum is that a curator can carry on from their predecesor. In a University, if that lecturer leaves, there is no one to take over their teaching collection. The teaching collections are often in such bad condition that musuems have had a difficult time checking what the specimens actually are. Bluntly put, I think the specimens are better off in a museum in the first place. They can be cared for and used much more. I have used collections for teaching University students. Why not have the ‘teaching collections’ in a museum and Universities use them through the museum? Unfortunately there is no law saying that they should be offered to museums first. Maybe museums need to talk more to universities to offer advice on how to look after their teaching collections. I have written a report for one teaching collection offering advice on safe storage, and ways of finding out the historical information about the specimens. I am working closely with another University to help digitise and care for their herbaria collection. Two other museums I know encourage undergraduates to donate their finds from their dissertation projects and how to record information correctly. These examples help build relationships between the museum to the University. Today many University departments are closing because there is less demand for degrees in plant sciences or zoology. As they close, the teaching collections with them are thrown out. Perhaps teaching collections would be better housed in a museum in the first place. Museum ramblings, human evolution and other sciencey topics.